What the heck? Olympics came and gone just like that! I just realize the first thing I always say on my post is how fast time has gone by! Ever since I started my very first "career" or as I like to call it my "Big Girl" job, I've been getting very little down time. Work and sleep consumes me. Anyways, I tried to have an easy and relaxed weekend. I went to Taste on Danforth to get some delicious Greek food and I really hoping to go Pottery Painting in that area too! One friend couldn't fit in the time and the other one wanted to go only if the other friend went. Ever since all the pottery painting places closed down in my hometown, I've been wanting to find another place. I found out that the closest one to my Toronto home is on the Danforth called The Clay Room and I was really hoping to do that and go to Taste on Danforth again with my friends today. That didn't happen but whatever, at least I went! Anyways, we ended up feeling lazy after brunch so we just hung out at my place and watched the closing ceremony. Since I had some creative energy in me from not going pottery painting, I decided to do nail art. 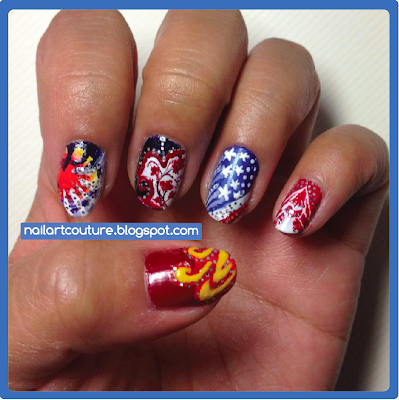 I mentioned on my last post that I wanted to fit in one more Olympic nail art before it was officially over. 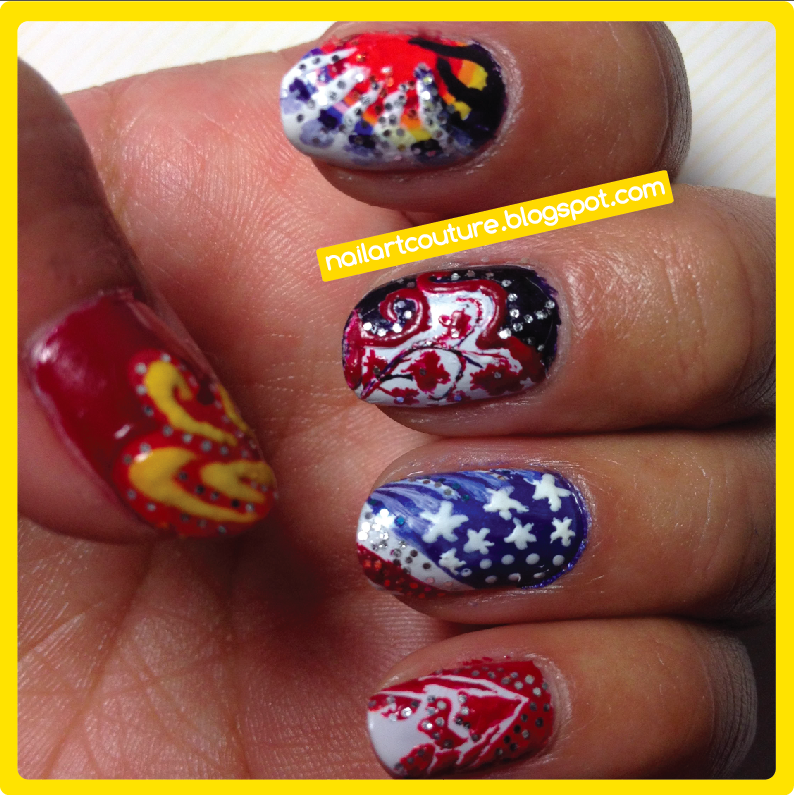 So this nail art is inspired by Women's Artistic Gymnastics suits, I'm not too sure what the proper term for them is. So you're probably wondering how long that took me, well I say about an hour and half. That's with have my attention spread across talking to my friend, watching the olympic ceremony, and then watching a movie, as well as some other stuff. As to how I got all the glitter on my nails that's all thanks to Nicole by OPI "Rainbow in the S-Kylie". Basically it's a polish that is mixed with multi color glitter specks. Basically what I did was I swiped one coat onto a piece of paper and used my toothpick to pick up the glitter speck that I needed. It does take a lot of patience, but I think the end result made it worth it. I was debating between Rythmic Gymnastic, Artistic Gymnastics, and Diving Bathing Suits. 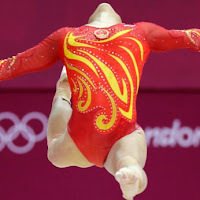 Rythmic gymnastic costumes were too flashy and complex and the diving bathing suits were too simple. 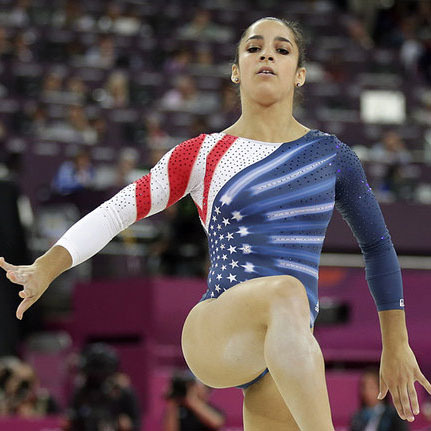 I wanted a challenge but not too much of a challenge, so I settled with Artistic Gymnastic suits. 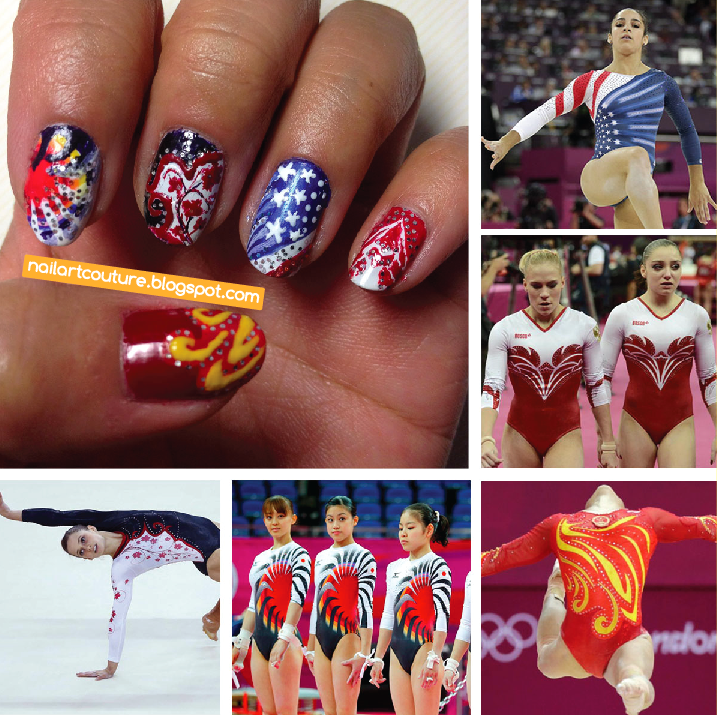 It was one of my favorite sports to watch during the Olympics and that was what made me decide on a olympic uniform inspired nail art. I think I made the right choice, I'm pretty proud of this piece. It may be one of my best ones! 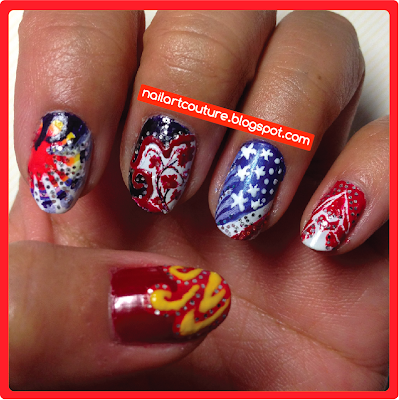 Also, I love how there were so many olympians who showcased their county pride by displaying it through nail art! Check out this gallery! There are so many other articles talking about olympian nail art, you just need to google it. I'm sure with this international event, it definitely skyrocketed the nail art trend even more. 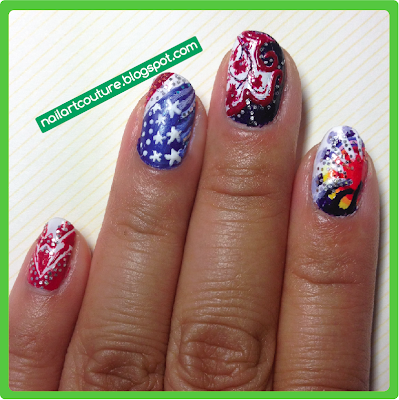 I hope you enjoyed my nail art in this post. If you have a nail art challenge for me simply click here to go on my Reader's Request and leave your request! My preference is something you haven't seen before and want done. Anyways, I hope you enjoy the rest of your week! This really looks amazing! AT first glance I thought you were thinking ahead to the Winter Olympics in Russia (2014) some of those colours would definitely fit with their colour scheme...check out their website! Great mani! I love all of the thought you put into your nail looks. My favourite nail is the USA one and the strategic glitter placement really adds something! Love it so much, lovely post!!! These are amazing! I love this idea as well! Just started following, please come stop by our page and follow as well? Holy crap! This would take me like 8 hrs to do! Your nails are amazing! That is some talent.